I posted this several years ago, but I’ve been thinking about it recently (especially in light of the rumblings in the presidential primaries). The book starts with an eloquent description of an elementary text book. An interesting object on which to base an argument, but C.S. Lewis does just that in his opening of what was originally a lecture series titled “The Abolition of Man” (the subtitle reads: Reflections on education with special reference to the teaching of English in the upper forms of schools). 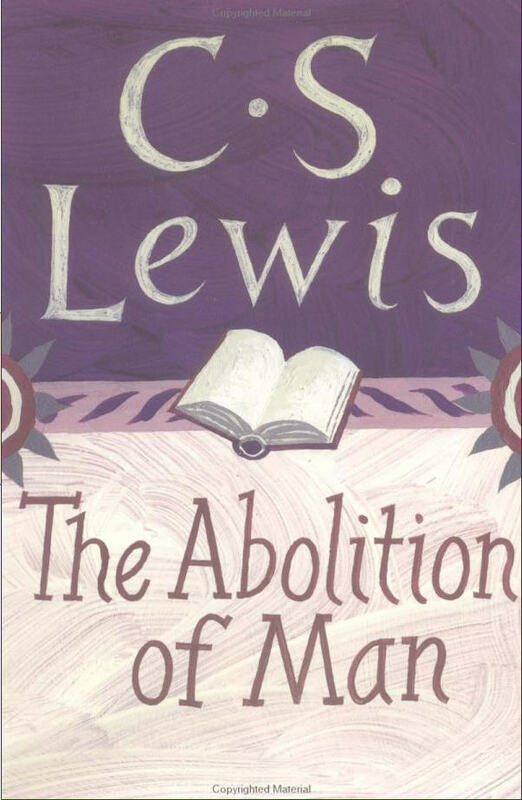 With all the nebulous talk of improved education among scholars and legislators, I have long wondered if there is truth to the fabled “subliminal message.” After painstakingly reading one of Lewis’ most controversial books, I submit that merely wondering at such a possibility is just as damaging as promoting it. C.S. Lewis refers to the elementary text in question as The Green Book and sets out to argue that the authors teach very little about literature. In fact, The Green Book essentially seeks to ‘debunk’ the existence of any objective value. Keep in mind, the young mind for which this text is intended has little reference for such a proposition. Boys and girls are more concerned with receiving good marks then defending the notion of objective value. And herein lies the danger. The authors (possibly unintentionally) are making no claims about literature. They are instead suggesting that human sentiment is contrary to reason and ought to be eradicated. Interestingly enough, as Lewis points out, to say something is reasonable or unreasonable means that there must be a standard to make that judgment. And now, by way of this disastrous summary of Lewis’ first chapter, we start to see the development of Men Without Chests. Assuming objective value is unreasonable, Lewis moves toward the logical question: On what grounds does any value exist in the world and what force would move me to protect this fleeting, traditional idea? Interestingly enough, though this idea is purported in institutions across the country, the opposite is expected in life’s vernacular. Students might be taught to disregard value and view all things in relativistic terms, yet when it is time to preserve society, all are called to sacrificially stand on the high grounds of character. Lewis writes that youth are encouraged to strive to be people of character, while being conditioned to believe such traits are unreasonable. Strip life of sentiment and you are left with a skeleton. Relativism may be trendy and “progressive,” but this kind of progress would lead straight to humankind’s demise. There will simply always be those who make the rules and those that follow them. If the rule makers decide life is void of sentiment, they will certainly reap the benefits of this stale standard. Dangerous? yes. Deceptive? yes. Merely wondering at the possibility of ‘value debunked’ is just as damaging as promoting it. Can we recapture the necessary distinction of humanity? Can we hold firm the objective value intrinsic to our created nature? I believe we were born for such a purpose. Maybe someone should write a children’s book about it. This entry was posted in books and films and articles, Old and New Literature, Recommendations, theology and philosophy. Previous Post Previous post: where is the floor in the morning? HI!!!! Oh how so true this is!! Keep up the awesome blog!! Thanks, Scott! This book was totally worth trudging through! This was written by a wonderful young woman in Christ, and she’s right on with everything she says, take the time to enjoy this wonderful blog. Thank you for reminding me about The Abolition of Man. I think I will have to read it again. It has so many good points. God bless. It definitely gives great perspective – and it’s sad how much things haven’t changed.